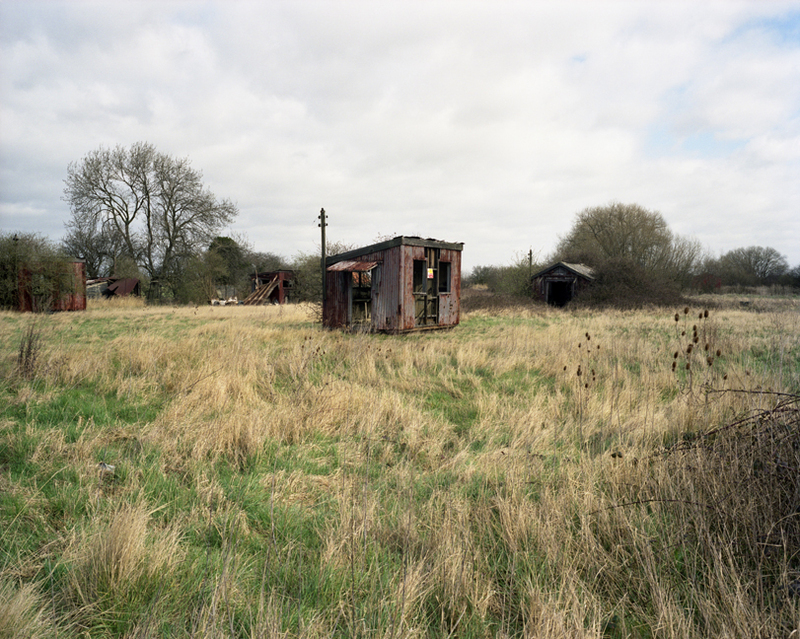 This photograph, one of a series, was taken on the site of the former Joseph Wells Fireworks Factory near Dartford, Kent, close to the Thames. These corrugated iron sheds, which for obvious reasons were spaced apart from one another, survive in an overgrown landscape of elder bushes and buddleia. Nature is constantly re-appropriating these spaces, with branches protruding through window slots and door-frames. How do structures like these feature in debates about what should be preserved in landscapes which are earmarked for regeneration? It could be argued that they constitute an important part of the post-war history of Dartford marshes and should therefore be preserved in some form. But how, and to what purpose? Do we need to argue for a third kind of open ground somewhere between the wildlife conservation park, which can sometimes appear over-defensive and protected, and landscaped greenery to be found in the suburbs around London nominally called ‘recreation space’? Unfortunately, planners and developers frequently see landscapes likes these as blank canvases that can be cleared or levelled flat. The specifics of place are something they would prefer not to have to address when making their decisions on the future of such ambiguous places. The publication of Frances Spalding’s generously illustrated biography, Prunella Clough: Regions Unmapped (Lund Humphries) is welcome. 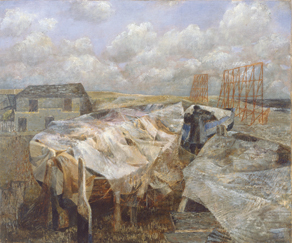 Clough (1919 – 1999) was a key artist in the post-war move away from the ‘Romantic Moderns’ – many of whom had spent the war drawing and painting scenes from religious and stately-home architecture for the Recording Britain project – to a fresh concern with the East Anglian coast and its wartime detritus. Having made an impact with her Surrealist-influenced picture of 1940, Sea Composition, she went on to paint Shore-line and War Defences (1941-42), Closed Beach (1945) and the acclaimed Dead Bird (1945-46), before taking up the cause of realism with scenes from the working life of docks, harbours and factories. Her colour palette was mostly based on sombre hues, rust and yellow ochre, with heavy black outlining of the principal figurative components. Clough’s choice of subject matter was original. Though John Piper had published his influential essay, ‘Abstraction on the Beach’ in 1936, few other artists had really got to grips with the strange atmosphere of the modern shoreline, though Paul Nash’s 1941 Totes Meer had already commanded great attention. Today there is a problem, however, with the iconography of decaying wartime pillboxes, block-houses, and beach anti-tank blockades, which have all become something of a cliché, as have the more organic forms of shoreline flotsam and jetsam, no matter in what fantastical configurations they are captured naturally or by artful design. As Spalding’s book reminds us, Clough’s seashore imagery remains more powerful and nuanced than most contemporary artistic depictions of the shoreline and its unique sense of the uncanny. This should be an interesting evening, involving three very different approaches to urban form. Austrian media artist Hubert Blanz is exhibiting work which takes a highly compositional approach to the signs and symbols of the city sometimes as circuitry, sometimes wholly computer-generated, and sometimes as traditional photo-montage. His particular interest in the London housing form, the subject of the Homeseekers project, continues the central European fascination with British terraced housing, most famously described in one of the greatest architectural studies of all time: The English House by Herman Muthesius, first published in 1905. Iain Sinclair is as much concerned with the psychological resonances of built form and topography as much as its constructional, visual history. He is well known as a walker and a chronicler of the myriad associations of past and present, fear and loathing, utopianism and catastrophe, in the life of the city. Andrea Zimmerman is an artist and housing activist in Hackney, whose film, Estate: a reverie, is a beautiful and moving record of how a run-down public housing tenement estate was transformed, through collaborative projects signalling the dignity and diversity of experience and personal history of many of the people condemned to live there. Where we live, how we live, and how the shape and feel of London exerts so much influence on the street life and culture of the city is bound to raise some very interesting questions. Ken will be chairing this event. 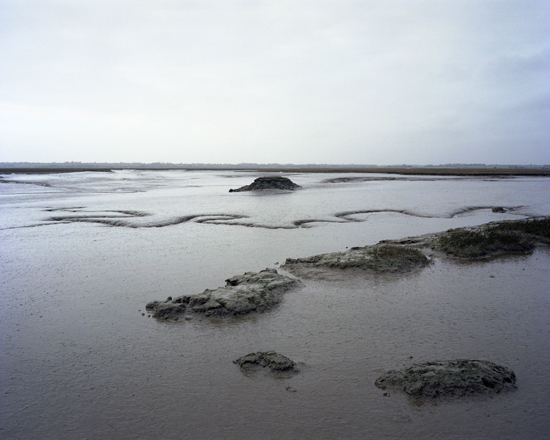 Jason and I have been doing a lot of walking this winter along the Essex coast – and even spending time on some of the smaller islands – while thinking hard about how to join Martin Amis’s ‘war against the cliché’ when it comes to writing about and photographing these tidal fringes. We spent several nights on Horsey Island in Hamford Water in late February, before the wildfowl breeding season, and got up in the dark for early morning forays along the seawalls, peering into the gloom to try to distinguish sky, sea and mud from each other, with little success. It is all very fluid and mysterious out there. Crossing the causeway to Horsey Island is an hallucinatory experience. Unusually, the causeway is below the level of the adjacent river-bed, so we were driving almost at eye level with the mudflats and flowing watercourses on either side, where the waders seem almost unperturbed, making it possible to pass within six feet of a curlew or cluster of elegantly-crested lapwings. The crossing is a white-knuckle ride from side to side and up and down through the pot-holes and small residual sea-water ponds left by the tide. The islands of Essex are too little known. Apart from their wildlife conservation qualities, they have also served in the moral rehabilitation of people, whether at Osea Island near Maldon, where conscience-stricken brewer, Frederick Charrington founded a Temperance Hotel – later being adapted as sanctuary for those with addiction problems – or on Canvey Island where ‘The Girls’ Bungalow’, otherwise known as the Social Institute, was established by Miss Clara James in 1909 (who later founded the Labour Party on the island) as a holiday home for working girls from East London. Canvey, where for a time I lived as a child, was also the setting for Hotel Ozonia, a temperance and fresh-air settlement, which in 1938 advertised over 60 rooms available for healthy recuperation. Less benignly, Bramble Island, also located like Horsey Island in Hamford Water, has been used for developing, testing and storing explosives, and is still very much out of bounds. Foulness Island, further south on the northern edge of the Thames Estuary, has for more than a hundred years been sequestered for weapons development and testing by the military. The indigenous community on Foulness was once so isolated from the wider world that the women of Foulness wore Dutch costume as normal attire until the First World War. Even I can remember carnival time on Canvey when we all had to dress up as little Dutch girls and boys.